What makes art? Amir Bar-Lev's fascinating 2007 documentary, My Kid Could Paint That, tries to answer this fundamental question that boggles those who do not understand abstract and modern art. Ultimately, perceived value and money is what makes art art in the eyes of the greater cultural community. 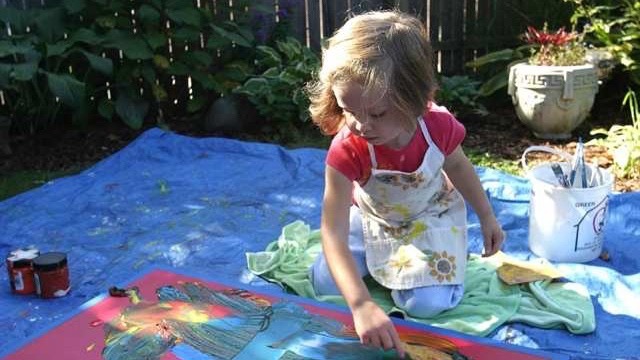 Marla Olmstead is a precocious, normal, well-adjusted three-year-old toddler who paints. Her paintings sell for thousands of dollars and she becomes a famous, celebrated artists for her abstract paintings. Art collectors find her work to meaningful and important and her age adds to the excitement. However, Marla is not a prodigy or child genius. She has no greater grasp of the meaning of art. She is a normal child who likes to paint and for all purposes paints exactly like a three-year-old. Marla is oblivious to her acclaim. She just likes to paint. The documentary explores the idea and public perception that modern art is a fraud perpetuated on the masses. Some find it impossible to tell what is and is not meaningful art worth preserving and collecting. Marla's work supports this theory. The first act explores Marla's rise as a celebrated artist and features interviews with collectors who claim Marla's work is truly ahead of her age and that it shows her maturity and master of the paintbrush. Slowly, the film explores the nature of art and what it means, how value is attached to abstract paintings and how Marla is able to channel that art without having a greater understanding of it. There is a sudden backlash. Marla's success and acceptance into the art community threatens its very legitimacy and this assertion of fraud is a convenient out. If any kid with no discernible special talent can produce such accepted, meaningful art, anyone can and it renders modern art worthless and shows it for the farce that it really is. No one really can tell or know what makes art art. Marla's sudden success stops with the question of whether she is an artist worthy of acclaim. The documentary takes a wild twist when 60 Minutes does an investigative piece on Marla and her family having an art expert analyze her work. She exclaims her paintings are undeniably worthy of acclaim but accuses her parents of fraud, believing Marla is not the true artist behind the artwork selling for thousands of dollars. 60 Minutes suggests that Marla's father is actually the one painting and that Marla is a normal child incapable of such artful paintings and without the talent and understanding needed for such polished work. The authenticity of Marla's art and art in general is called into questioned. "It's documentary gold." Suddenly, within the film, everyone addresses what the nature of the documentary will be and how it will portray Marla and her family. Everyone starts asking Bar-Lev's intention with the documentary and if it could be a hit job on the family or a critical dissection of modern art. Now the family, somewhat disgraced, with the accusations of fraud look to Bar-Lev and the film we are watching to redeem themselves as honourable people and parents who were in over their heads. Bar-Lev relays his mixed feelings and uncertainty on what the film will be. Marla's mother constantly questions the access she has given Bar-Lev but insists she trusts him and is confident her and her family will be redeemed and Marla will be shown as not only a normal girl but the true artist and that the art community is perpetuating this lie in order maintain their legitimacy as Marla's success presents a threat to them. My Kid Could Paint That really relies on the viewer to make judgments, not only on Marla's work, but her parents, the art community, and the nature of art itself. Does it matter who painted these paintings? If my kid could paint that, does it make it any more or less valuable? The hoax might not be the paintings but the art of abstract expressionism. We must put value on not only Marla's art but all art ourselves instead relying on hype. Bar-Lev shows us Marla's work and we are left to decide what is and is not art. Like with art, there are no definitive answers. No one really understands the attached value to works of modern abstract paintings. It becomes clear that art buyers seem to gravitate to Marla's work because of her age and appeal. Here and brother could be from a Gap ad. No one seems to enjoy her art once the hype clears. Doubts enter art buyers' mind. The documentary plays on so many levels exploring the possibility that Marla's paintings are a hoax but also that modern art is the greater hoax perpetuated on society. If art is art, ultimately, things like the artist are irrelevant but the art market is driven by perceived value, noteworthiness, speculation. My Kid Could Paint That questions what makes art and how abstraction and expression works, but also society's desire to build a subject up only to tear them down, while being a intriguing look into the documentary process as all these questions and ideas unravel during filming because, "All art is in some ways, a lie." "There is this large idea out there that abstract art and modern art in general has no standards, no truth or something. And that if a child can do it, that it sort of pulls the veil off this con game and shows you that somebody who's four years old can do something that's every bit as good as what a, you know, famous artist who sells pictures for millions of dollars can do. That idea that art is not really about some truth but it's about some lie being hoisted on the public." That is very original and so creative art work. I'm sure it will inspire many people of your arts. I also want to share my abstract art gallery you can check at http://petesoriginalart.com.